Sitting in a classroom at the University of Lome, a discussion is underway with one of the tutors about his recent encounter with a “djinn”. He was quick to explain to me that “in Togo you never believe in just one thing. We might be Christian or Muslim but there is always something else.” "Vodun", as it’s known in Togo and Benin, was a theme which would present itself time and again in the coming months in trance ceremonies, festivals, shamans, fetishes and rites of passage. This is a world where people are connected deeply to the spirits of their ancestors and households very often keep shrines designed to protect these deities. It may be un-centralized but Vodun is still is a full belief system which bears no resemblance to the negative connotations of witchcraft in the west. In Benin it is classified as an official religion and it has its own cosmology, set of healing practises, symbols, rituals, divinities and moral guidelines. I wasn’t quite sure what to make of Lome’s Akodessawa Fetish Market with its rows and rows of dead animal skulls, hides and skins piled up on tables. Voodoo priests reside in huts where it is believed that they consult with deities. Using different talismans, herbs and animal parts, they concoct remedies for all manner of ailments. Though certainly a tourist destination – a clever idea launched by Beninese businessmen – it still sets the scene for an omnipresent religious and cultural identity. To unravel anything with greater depth takes time, patience and a very good guide. Each year on 10th January the Ouidah Festival takes place in Benin – this is the largest, most accessible, and some might say “staged” of Benin’s Vodun events, but it is certainly a good place to start. 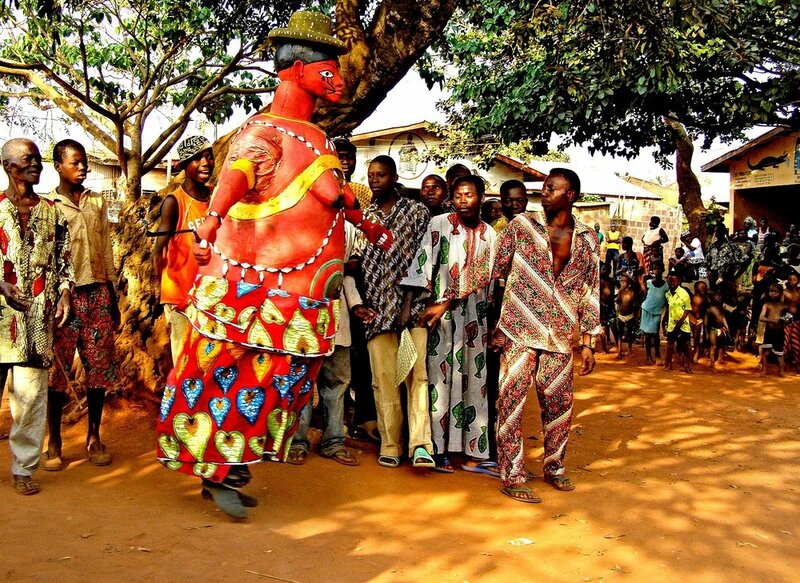 Ouidah is really the voodoo capital of Benin and hosts many different ceremonies throughout the year. It is also extremely important for its role in the slave trade. The foreboding “Door of No Return” is a monumental arched gateway which signifies the last place hundreds and thousands of people would have seen before being forced onto boats slavery boats – many of those bound for Brazil. There’s the amazingly colourful, vibrant Geledé festival, dedicated to Mother Earth or Iyà Nlà as she is known locally and is characterized by the beautifully-crafted masks worn by dancers accompanied by singers and drummers. The festival is an ode to Yoruba heritage and includes the symbolic use of animal figures such as birds and serpents. The traditional Zangbeto ceremony wards off evil spirits and is led by a secret society of mask wearers who cannot reveal their identity. This was one of the most intriguing aspects for me – the secrecy, sacred traditions passed down through birth right, that as a tourist you are exposed to just a fraction of the depth of this belief system. These destinations are not for the faint-hearted, they demand resilience and patience, but from a cultural, musical, and religious standpoint, I’m hard-pressed to think of anywhere more fascinating. Contact us at info@anotherafrica.com to plan your journey to West Africa.